I use Shiatsu a lot, on a daily basis, in our family life. Today I have used it for tiredness, patience (2 small children) & for a blocked nose. I so enjoyed giving Shiatsu massage over the weekend, & having a break from my mothering duties, I left my sons at home with their dad. Taking a break also meant that I have perspective on daily rhythms & interactions & I’m keen to hold that perspective for as long as possible. I managed to find two minutes to do some Shaitsu related exercise this morning, to help with my own tiredness after a busy weekend. I continued through the day to keep my energy flowing, & therefore my patience with my kids. I did this using stretches, breathing techniques & lying for 2 minutes at a time to focus on my own body. My husband has been working hard & I noticed through visual diagnosis, the first form of diagnosis used when you meet a Shiatsu client, that his meridians eelating to tiredness were low in one area. Whikst he as making a cup of tea & did a small amount of Shiatsu massage & he mentioned later that he felt lighter afterwards. Then this evening my youngest seems to have caught a cold & was distressed at bedtime as he couldn’t breathe. I held a pressure point for blocked noses & sinus issues & he relaxed & feel asleep quickly. Children are generally very responsive to Shiatsu & the results can be super quick. I love giving Shiatsu massage treatments to clients in my quiet practice room in Exwick, Exeter. Giving them the space to relax & re-invigorate. Space to express concerns & then feel how that is in their body, to release that tension. 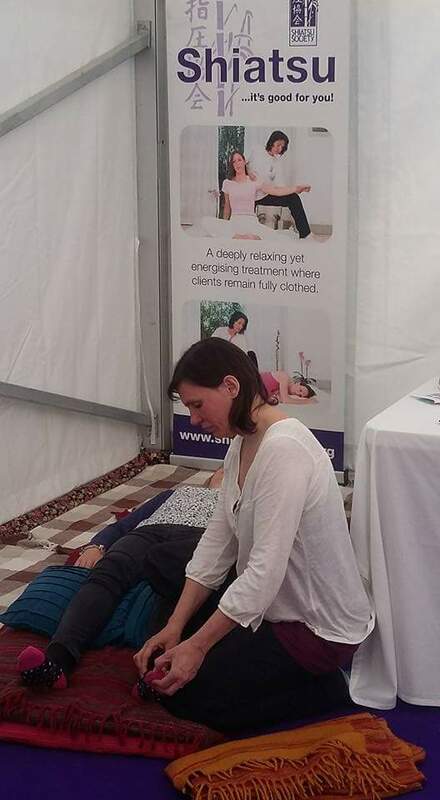 It is great to see the relaxation & relief in people’s faces & bodies after a Shiatsu & to hear they got relief from the condition or concern they came with. However, it is also great to have Shiatsu for my daily life to support & help my family & myself. I am able to teach Shiatsu to people, to use on themselves & their friends & family. I hope to set up a course in Exeter to teach this so if this is something you maybe interested in please get in touch. I am always happy to talk Shiatsu so if you have pain or physical difficulties, stress or other emotional issues then get in touch to see if Shiatsu may be able to help. 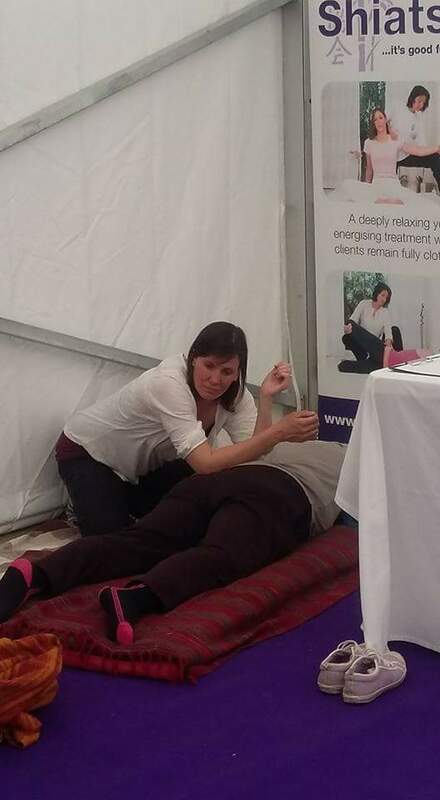 I’ve just enjoyed a really happy & satisfying weekend giving Shiatsu treatments at the North Devon Mind Body Soul festival. The event is much bigger than you might imagine with over 60 exhibitors & a great mix of services on offer. It was a really friendly atmosphere, with lots of chat, laughter & networking. 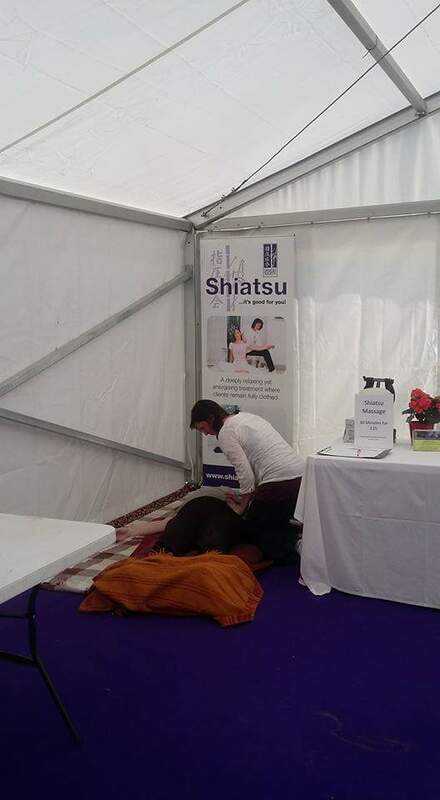 For me the amount of Shiatsu massages I gave was perfect, not too many & not too few. It was a great mix of clients & I felt a strong sense of connection with them all. I already signed up to attend next year I enjoyed it so much!